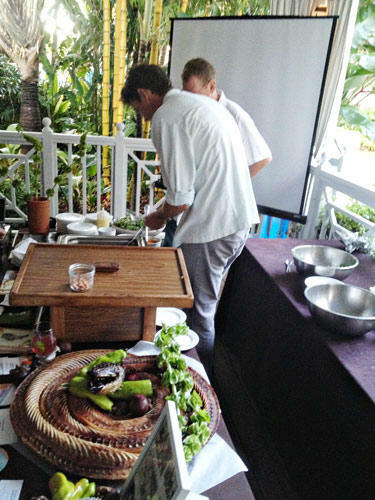 Chef Kris Wessel used the imposing python in the foreground to make smoked and braised python for Fertile Earth Foundation's Underground Miami fund-raiser. Just what does python taste like? The braised python-and-Brazilian-pepper fritter I sampled was reminiscent of eggplant tempura in taste and texture--with maybe a hint of turnip. Kris Wessel, executive chef at Florida Cookery, had prepared this innocuous-looking fritter (in contrast to the scary-looking whole creature) for the Fertile Earth Foundation's Underground Miami fund-raiser. As I was preparing to head over to the Underground event last week, I read about some of the invasive species that would be offered on the menu. Some of the information was less than appetizing: Python rife with mercury? What was this "brucellosis" found in pigs? Granted, these foods are more of a niche interest among adventurous foodies than a widespread trend. 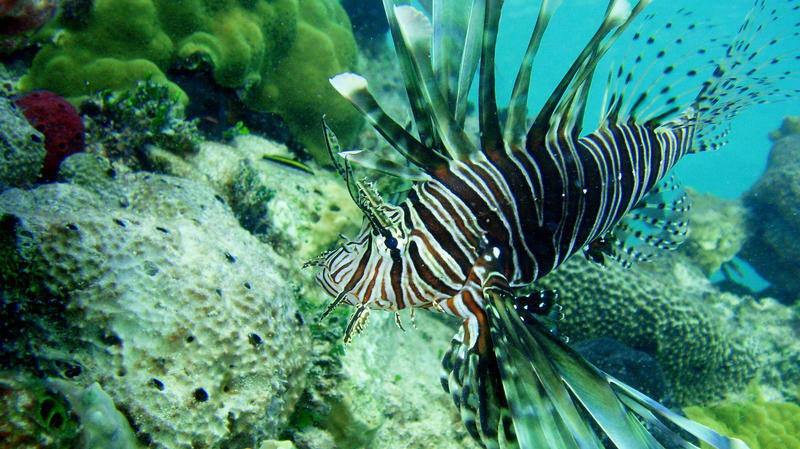 However, in the past few years, there has been more conversations about building markets and appetites around invasive species like carp and lionfish to help curb their relentless population growth. Jackson Landers collected his accounts of hunting and eating invasive species like nutria, Asian carp and iguana. 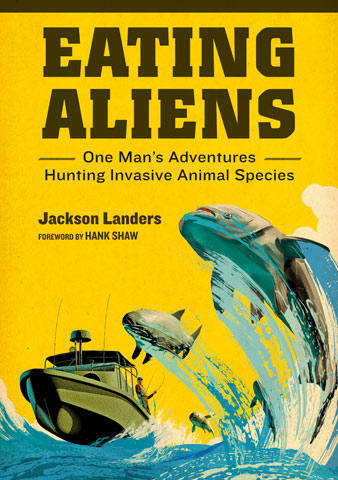 Jackson Landers, also known as "The Locavore Hunter," is the author of the book Eating Aliens: One Man's Adventures Hunting Invasive Animal Species: "I don’t claim that eating invasives is a one-spot-solution. Creating a market can be part of the solution. I would say one of the biggest things we can do is stop studying the problem and start solving it, which sounds trite." But that's what Landers did: he learned to hunt and eat invasive creatures like iguanas and carp. "It’s no different than domestic livestock---maybe less so than what I’ve seen. Animals packed in like sardines in a factory farm have much more potential for transmission of disease. Individual slaughter in the wild is also safer, as opposed to a slaughter house where ground meat is produced." I was sitting on the verandah of a hotel overlooking Waikiki beach waiting for a lunch menu. The mighty Pacific Ocean purred like a Lamborghini in the distance. I'd spent hours walking in Chinatown from early morning looking for beautiful and unique dishes I love to use for the thematic ‘Tasting Menus’ at our restaurant. But I had little luck and a keen hunger was rising up in me.